Sherry is currently studying a BSc (Hons) in Speech and Language Therapy. She is an active member of the Students’ Union; and is currently president of the Speech and Language Therapy society, a General Representative on Student Council, an active volunteer and BAME Students Women’s rep. Sherry was also elected to be on Academic Board for the University and on the School of Social Sciences Academic committee. 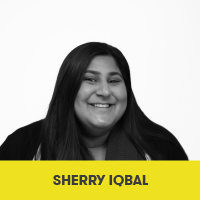 Sherry has previously been a course rep, school rep and Vice Chair of Student Council. Before coming to Leeds Beckett, Sherry deferred her entry year twice to take up the elected position of Sabbatical President at Middlesbrough College. Sherry is an avid reader, tennis lover and a student activist. She hopes to practice as a successful Speech and Language Therapist in the future, with the potential for this to lead onto working in policy, governance and/or campaigning for Allied Health Professionals.